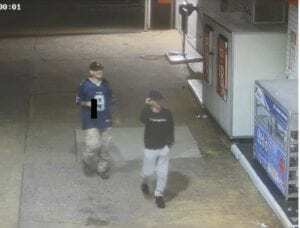 Police have released an image of two men they wish to speak to, in relation to an armed robbery at East Maitland. 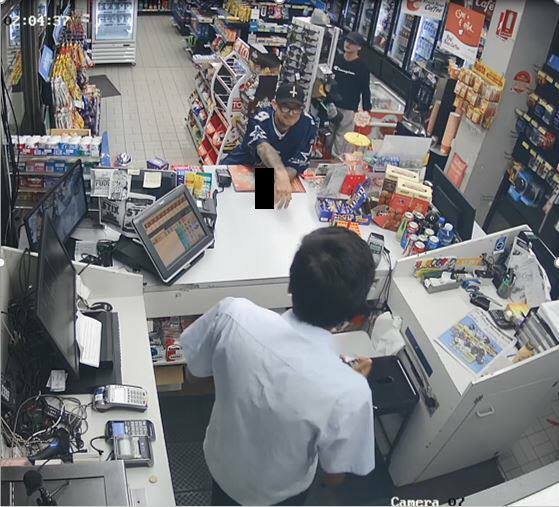 Around 3.20am on January 15, two men entered a service station on the New England Highway. One man asked the attendant for cigarettes, while the second man took items from the rear of the store. When the man told the attendant he didn’t have any money, the employee refused to hand over the cigarettes. The man threatened the attendant with a bottle he was carrying. He then walked around the counter, pushed the employee, and took the cigarettes from him – while the second man searched the employee’s backpack before both men fled. – aged between 30-35-years of age, 170cms tall, medium build, wearing a black cap, ‘Dallas Cowboys’ NFL shirt, camouflage pants, and carried a brown bottle. – around 20-years-old, 165cms tall with a medium build, wearing a black cap, black long-sleeved shirt, and grey trackpants.